Highlight: Located 90 kilometres east of Jundah is the site of Magee's Shanty, believed to be the site of the shanty immortalised in Banjo Paterson's poem "A Bush Christening." Departing Welford National Park, return the short distance northwest to Jundah for the conclusion of your drive. Jundah is the closest town to Welford National Park and is an ideal base if you would prefer day visits. Located 90 kilometres east of Jundah is the site of Magee’s Shanty, believed to be the site of the shanty immortalised in Banjo Paterson’s poem “A Bush Christening.” For more information call into the Jundah Visitor Information Centre and Library for friendly service and free internet access. Highlight: The Thomson River - an ideal spot for some scenic fishing and river drives. Begin your drive in Jundah on the banks of the Thomson River – an ideal spot for some scenic fishing and river drives. Explore the Barcoo Shire Museum offering a window into the early pioneering times of the district and learn the unique process of the Jundah water treatment at the Reverse Osmosis Plant. Take the Settler’s Nature Drive along the Thomson River featuring sign-posted descriptions of native plants. Unique “Welcome Signs” to the town replicate the historic shop front still to be seen in the main street of Jundah. Each of the signs is linked together by a walking trail, and contains different information giving an insight into the early years of the township. Meet local characters and enjoy outback hospitality at the Jundah Hotel, open for lunch and dinner and offering air-conditioned accommodation. 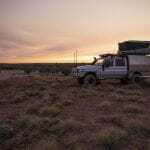 Caravan Park and free bush campsites are available in Jundah. The annual Sheep Shenanigans event is held in June featuring sheep races complete with unusual jockeys. Proceeds benefit the Flying Doctor and Jundah Progress Association Inc.
From Jundah, take the top road over the Thomson River crossing and through ever-changing landscapes to Windorah, which is Aboriginal for “Big Fish”. 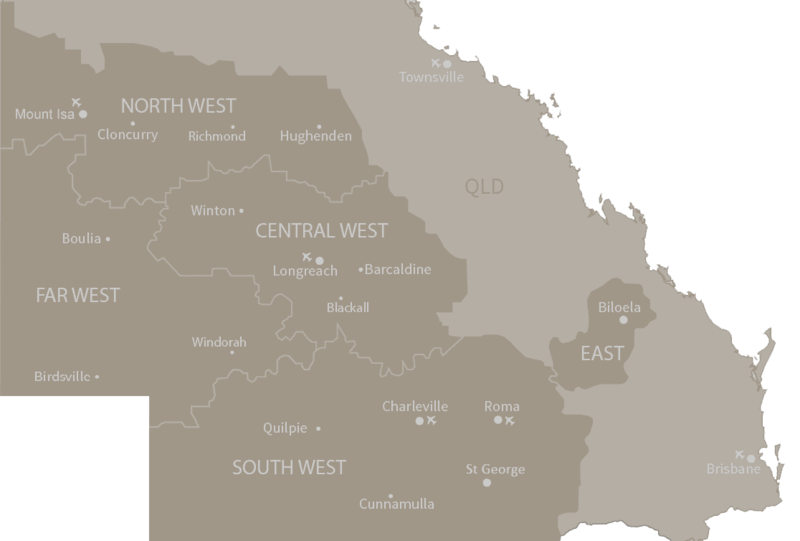 Windorah is 35 kilometres south of where the Thomson and Barcoo Rivers join to form the multi-channelled Cooper Creek. Local waterholes offer great fishing and the smaller channels are ideal for catching yabbies – the inspiration for the Windorah International Yabby Race held annually in August. 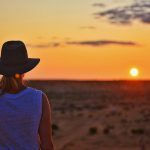 The magnificent red sand hills found ten kilometres west of Windorah are definitely worth visiting as the colours change continually throughout the day, especially at sunset. Visit the original slab hut in Windorah, which was relocated from its original site on the Whitula Creek banks and tells an interesting historical story of the town and its people. Windorah Solar Farm is the first solar farm trial by Ergon Energy with five mirrored dishes that generate enough power from the sun to supply most of Windorah’s energy requirements. 80 kilometres west of Windorah lies the JC Pub Ruins, once part of the township site of Canterbury. Windorah offers cabins, hotel, caravan and campsites. From Windorah, head south-east towards Quilpie for 50 kilometres, then turn left onto the Jundah-Quilpie Road and head north-east towards Welford National Park. Drive along black soil roads on the Barcoo River flood plains before arriving at the Barcoo River crossing. 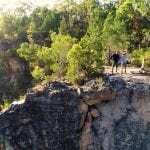 Drive over the Barcoo River Crossing to the Retreat Station intersection before entering Welford National Park. 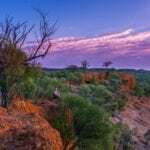 Little Boomerang Waterhole is the starting point for several scenic drives (four wheel drive access only), the 12.3 kilometre River Drive and the 22 kilometre Desert Drive. Welford is a land of contrasts-wide coolabah lined waters and grey alluvial channels of the Barcoo River slice a brown and green swathe through Mitchell grass plains and arid mulga woodlands. Golden-green spinifex and white-barked ghost gums grow atop a vivid backdrop of red sand dunes. Remnants of Aboriginal heritage and use, including water wells and stone arrangements, are found throughout the park. You can see a rare (rammed earth) homestead built on this former grazing property in 1882. Welford National Park is open all year; however wet weather may cause temporary closures, especially during the wet season from December to March (permits are required).